It took just two days for dissenter Petro Georgiou MP to speak out about the Rudd Labor government's changes to mandatory detention policy. That was of course not surprising, because together with Judi Moylan and Russell Broadbent, Georgiou had formed a dissenters block standing its ground against detention of children during the Howard government, and when the time came they crossed the floor in Parliament to oppose the "Ban the Boatpeople Bill" in 2006. Our first reaction invoked the notion of "smoke and mirrors", but now that the dust of initial reactions has settled, more in-depth reflections on the changes are needed. This page brings together some published opinion, beginning with Petro Georgiou. Amongst the opinion writers are Senator Andrew Bartlett and The Australian's Mike Steketee. New Matilda, Mandatory detention: No Hard Feelings? 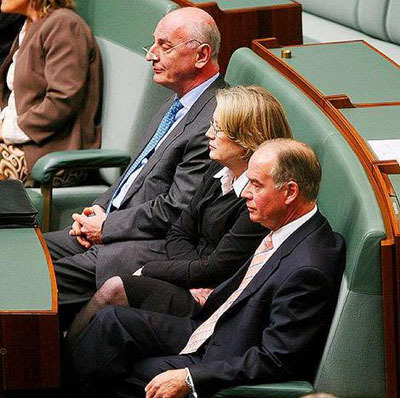 9 August 2006: The Coalition Rebels speak out - Three Government MP's, The Hon Judi Moylan, Mr Russell Broadbent and Mr Petro Georgiou crossed the floor over the Migration Amendment (Designated Unauthorised Arrivals) Bill 2006, sat in the opposition benches, and voted against the Bill with the Australian Labor Party and others opposed. Here are their remarkable speeches. 16 May 2006: David Manne at the "Boatloads of Extinguishment?" - "The new policy of 'Radical Rejection' not only involves offshore processing. The Government has also refused to discount the possibility of using our navy to intercept or interdict boats with asylum seekers on board, without undertaking any assessment of the person's fears or need for protection..."
Despite welcome changes, the minister and department still have too much power over the lives of asylum seekers. FOR MORE than a decade, the treatment of asylum seekers arriving by boat has been gravely at odds with the strongly held commitment to justice and compassion that this nation has demonstrated repeatedly at home and abroad. The policy of mandatory detention of unauthorised boat arrivals was introduced by the Labor government in 1992. It was toughened during the Howard government, and new measures were introduced, such as the temporary protection visa and the excision of Australian territory. People who sought our protection have been treated more harshly than people accused of serious crimes. Unlike the criminal law, the law relating to detention of asylum seekers does not allow any court to review whether their detention is necessary or to order alternatives such as bail. The detention policy resulted in thousands of men, women and children being locked up in prison-like conditions, sometimes for years, regardless of whether they posed any risk to the community. Many who had committed no crime and were not considered dangerous were effectively imprisoned for longer periods than violent criminals. Long-term detention caused many to suffer significant physical and mental harm. In 2005, some colleagues and I proposed two private member's bills seeking major changes to immigration detention and an end to temporary protection visas. The Howard government's response included: the introduction of legislation in which Parliament affirmed as a principle that a child shall be detained only as a matter of last resort and which enabled families and children to be released from detention centres; the review of long-term detainees by the Commonwealth Ombudsman; and the rapid processing of holders of temporary protection visas applying for permanent residence. The reforms did make a difference. They were, however, less than I and others wanted and believed were desirable and possible. I supported Immigration Minister Chris Evans' announcement earlier this year that the temporary-protection-visa regime was to be abolished. It has been a punitive policy that kept refugees living in fear of being returned to places of great uncertainty and prevented them from applying to reunite with their families. This week's reforms to detention policy are substantial and are a further step towards the establishment of a fairer, more humane and accountable approach to the treatment of asylum seekers and others subject to immigration detention. They will create a more transparent and decent system without compromising domestic and external security. Of particular significance is the change permitting those who pose no danger to the community to be released while their visa status is resolved. Unauthorised arrivals will be initially detained only for the purpose of health, identity and security checks. Detention will otherwise be limited to those who pose a risk to the community, or have repeatedly refused to comply with visa conditions. The improvements that these changes bring are clear, but there are caveats. Under the new system it appears that people may still be detained -- even indefinitely -- at the discretion of the department and the minister. The minister says the department will have to justify why a person should be detained. But justify to whom? According to the minister, to a "senior departmental officer". This means that the department retains the right to be judge in its own cause. Justification to an external authority will only be necessary after a minimum of six months. Even then, the external agency in question -- the Commonwealth Ombudsman -- will be involved only at the minister's invitation and not as the result of any power conferred by law. Given the injustices that have historically characterised mandatory detention where there has been no independent review process, such an arrangement is not entirely satisfactory. Further, it appears the reforms will be carried out by administrative fiat. Improvements of any sort are to be welcomed, but the lack of legislative mandate means the reforms are especially vulnerable to the vagaries of the political winds, which, as we know, can shift abruptly. The minister's announcement also does not mention whether there will be alternatives to detention such as bail arrangements or whether the conditions of release will include work rights and access to medical care. The new Christmas Island facility is being maintained to deal with any major rise in unauthorised arrivals. I visited this facility recently, and it is, as the minister has noted, a "maximum security environment". A jail-like institution is completely unnecessary, inappropriate and a potentially harmful place for vulnerable asylum seekers who may have already endured significant suffering before their arrival in Australian territory. The treatment of asylum seekers and refugees over the past 10½years has damaged and traumatised many vulnerable people. A comprehensive system that addresses all policy objectives, including the humane treatment of asylum seekers and refugees, requires significant external, legislative and judicial protections. Unchecked discretionary powers in the hands of ministers or departments have proven a recipe for abuse and inhumanity in recent times. Our treatment of asylum seekers and refugees has improved and the new changes are significant. But the task of reform is not complete. PHILIP Ruddock, architect of Australia's brutal policy towards refugees in the Howard years, says the Rudd Government has the luxury of now taking a different approach. That is because of his success as immigration minister in reducing the number of boatpeople, he adds. So would a re-elected Howard government have softened the policy? Apparently not. Ruddock tut-tuts that the changes announced on Tuesday by Immigration Minister Chris Evans will encourage people-smugglers, and Opposition immigration spokesman Chris Ellison worries that hundreds of "unlawful non-citizens" could disappear into the community. Note the language: the Coalition remains stuck in the Ruddock mindset of dehumanising people who flee to Australia seeking protection. This was part of the elaborate policy structure he set up to turn human beings into faceless categories, lock them up in remote detention centres and block access to lawyers and the media for fear that Australians might sympathise with them as fellow human beings. Despite Ruddock's boast, there is no direct evidence that his policies stopped the flow of boatpeople. Long-term mandatory detention was introduced by the Keating government in 1992 but did not prevent the surge in asylum-seekers that started at the end of the decade. People fleeing death or persecution do not spend a great deal of time contemplating whether they are better off in the Australian desert. Perhaps the policy's draconian application by the Howard government and the international notoriety it achieved by turning back the Tampa in 2001 had some deterrent effect. But the fall in numbers coming to Australia coincided with a drop in refugee movements across the world. Even if Ruddock is right, that is no justification for policies that had no precedent for their harshness in any developed country. Of the 9160 boatpeople arriving in Australia in the three years to the middle of 2002 - the peak years in recent times - 8260 were refugees and were resettled in Australia or other countries. That is, they were assessed as having a justified fear of death or persecution in the country from which they had fled. That 90 per cent compares with the 15 per cent who come by air and typically succeed in asylum claims. Yet these people were not stripped of their legal rights and treated as subhuman, for the simple reason that they were not visible and therefore not a political problem. The measures taken to stop boatpeople staying as refugees were out of all proportion to the threat they represented. Despite the hysteria around the arrival of the Tampa in 2001, in the wake of September 11, not a single one of those it rescued turned out to be a terrorist. Australia's policy of indefinite, non-reviewable, mandatory detention punished people who mostly had committed no crimes and already were traumatised. Often the damage has been long-lasting or permanent, as is becoming clear from the string of cases wending their way through the courts. In 2006, Shayan Badraie, who was kept in detention between the ages of five and seven, received $400,000 in compensation for mental harm. At the start of this year, Parviz Yousefi, a former Iranian oil industry engineer whose wife says he will never work again and who requires medical care for the rest of his life, received $800,000. Isolated cases? Not according to those who deal with refugees. Adelaide barrister Claire O'Connor says she has yet to meet anyone who was in a detention centre for a year or more who has not been damaged as a result. "Typically they cannot settle, they can't get employment, they can't form relationships," she says. "Many of my clients will never recover from the harm detention did to them." The University of Wollongong's Centre for Health Service Development took a sample of 720 of the 7375 people in detention in 2005-06. Director Kathy Eagar says that in the first few months they averaged one medical condition, but after two years this had increased to seven. It was not just the fact of their detention but its nature that caused the harm. Indefinite detention, typically dragging on for years, succeeded in creating despair but did not force people to return home. In theory, asylum-seekers could get legal advice but in practice they had to nominate a specific person, a challenge for a person from overseas locked up in a detention centre. O'Connor received phone calls telling her a German woman was in detention but she was unable to gain access. "Cornelia Rau could have got out a lot earlier if she had the same rights as a prisoner," she says. Refugee advocate and lawyer David Manne says people had to resort to "legal information smuggling" to get the names of lawyers they could contact to asylum-seekers. Even when assessed as refugees, the uncertainty continued because the best they could hope for was a temporary protection visa, which put their future in doubt again after a few years and prevented them bringing their family to Australia or travelling overseas. The Rudd Government has stripped away much of this panoply of punitive measures. The misnamed Pacific solution, which shunted our problems off to Nauru and Papua New Guinea's Manus Island, has been abolished, as have temporary protection visas. Under Tuesday's changes, most people are detained only as long as required to undertake health, identity and security checks. If cleared, they are released into the community while their claims for asylum are assessed. This reverses the onus of proof, with the Immigration Department required to justify every three months why asylum-seekers remain in detention. They will receive government-funded legal advice and be entitled to an independent review of decisions that go against them. This brings Australian policy more closely into line with overseas practice. There are shortcomings. The Government will continue to run a two-class system by keeping Christmas Island and other Australian islands outside the migration zone, meaning boatpeople will not have the same rights as asylum-seekers who arrive by air and who have full access to the Australian legal system. Time limits could have been set for detaining people while checks were undertaken, as is the practice in other countries. But Australia at least has a policy it can justify in terms of basic humanity. WHEN Chris Evans asked, in his first meeting with Immigration Department officials, why eight Burmese asylum seekers were detained on Nauru, there was an embarrassed silence. Why were these men, all assessed as legitimate refugees, still stranded and slowly going mad? Because the Howard government wanted it that way, he was told. In eight months, the department has shifted from a Pacific Islands amble to (bureaucratic) warp speed. Two weeks ago, the Federal Court ruled in favour of a man detained on character grounds. Within five days, the department had assessed and released 15 long-term detainees, making up 25 per cent of people detained on character grounds. The department claims it simply carries out the policies of the government of the day. For the previous minister, Kevin Andrews, that meant "lock them up, kick them out or keep them out", according to one senior department official. The department's quickened response reflects Evans's desire to clean up the portfolio and Australia's reputation. He has turned immigration detention policy inside out: closing centres on Nauru and Manus Island, ending the damaging temporary protection visa system and concluding legacy cases such as the Cornelia Rau compensation case. Yesterday, he effectively ended mandatory and indefinite detention, a policy introduced by his own party, under Paul Keating, in 1992. His landmark speech on immigration detention policy was an apology in all but name. He rejected the notion that "dehumanising and punishing unauthorised arrivals with long-term detention is an effective and civilised response". He said the Howard government's punitive policies "did much damage to those individuals and brought great shame on Australia". He was right on all counts. Evans has committed the Government to immigration detention as a last resort, for the shortest practicable time and rejected indefinite or otherwise arbitrary detention. In a complete inversion of the former policy, the Immigration Department will now have to justify a decision to detain, not presume detention. It is a long way from the Tampa. There are still grey areas - on detention on character grounds, the retention of Christmas Island and an island excision zone - but overall, Evans's initiatives will deliver a policy that more closely "reflects the values of Australian society", as it should. Immigration Minister Chris Evans announced this week that, under a new set of values to be legislated by the Rudd Government, "the current model of immigration detention is fundamentally overturned". There was almost universal praise for the announcement, which was hailed for being positive and more humane, effectively overturning mandatory detention and, in Evans's words, part of "tackling the worst excesses of the Howard (government's) immigration legacy". Only Opposition immigration spokesman Chris Ellison criticised the plan as promoting "a more relaxed attitude" to border security that would send the wrong message to potential refugees and people smugglers. Indeed, the reforms were welcome and more humane. Refugee groups were hesitant to criticise the positive steps towards overturning immigration detention, and Evans's announcement was generally endorsed. Yet there should have been more criticism of the Labor Government for not going further and honouring all its election promises in word and spirit. What's more, Ellison's attack would have been more credibly applied to the Government's cant and political dissembling. The simple fact is that the Evans proposals do not alter the basic building block of Australia's bipartisan immigration policy of the past 15 years: mandatory detention. It doesn't matter what you do to finesse the implementation; the character of any system will be determined by its basic philosophy. What Evans has done - reversing the onus on detention, guaranteeing children will not be detained, expanding access to legal advice and improving physical conditions for detention - is worthy and he is to be congratulated. But the Labor Government wants to have its cake and eat it, too. Evans's announcement was full of rhetoric about how low the immigration system had sunk, the worst excesses of the Howard government, continued punishment, inhumanity and harsh systems. "The Rudd Government will reform our immigration detention policies in a way that reflects the compassion and tolerance of the Australian community," Evans said. "In the future the immigration system will be characterised by strong border security, firm deterrence of unauthorised arrivals, effective and robust immigration processes, and respect for the rule of law and the humanity of those seeking migration outcomes." What Evans is proposing, though, is further refinement of the system of immigration detention based on mandatory detention. This includes the Howard government's detention centres, commercial management of detention centres, excision of Australian territory from the Immigration Act, detention while security and health checks are completed, continued detention if identification cannot be made, naval patrols, interdiction of boatpeople and the keeping in reserve of the Christmas Island detention centre in case of a surge of boatpeople arrivals. And why is all this policy and paraphernalia being left in place? Because the Labor Government intends to continue to decide who comes into Australia and how. And why does it want to be like the Howard government on immigration detention? For the same reason the Howard government continued the Keating government's policy of mandatory detention and keeping people, including children, behind barbed wire: the integrity of the migration system. Labor has an even greater incentive than the Coalition to preserve the integrity of the immigration system. The Rudd Government is expanding permanent and temporary immigration and attempting to do it without fanfare. At the same time, it also has to satisfy its election commitments on the heartland Labor social justice issue of refugees and detention. Hence Evans's declaration this week: "The challenge for Labor, having tackled the worst excesses of the Howard immigration legacy, is to introduce a new set of values to immigration detention, values that seek to emphasise a risk-based approach to detention and prompt resolution of cases rather than punishment. The best deterrent is to ensure that people who have no right to remain in Australia are removed expeditiously." But, in his exposition of the rest of Labor's policy, he committed to "maintain mandatory detention and the excision of certain places from the migration zone", "extensive patrolling of our borders by defence, customs and other law enforcement agencies", and declared that "unauthorised arrivals will be processed at Christmas Island" and those who fail the refugee test will be removed expeditiously. All these are to be kept to "support the integrity of Australia's immigration program". Evans is attempting to offer relief for detainees through an improved and faster assessment for security and health reasons, yet this has been the bugbear of governments for decades. Indeed, in 1993, Philip Ruddock attacked the immigration minister at the time, Gerry Hand, not over mandatory detention but over delays in processing. While the onus will be on the department to say why someone should not be released into the community if they are not a risk, Evans concedes people will be held until they can be identified and given security clearance. He also concedes that means people will be held for long periods, even if he hopes it is fewer people and for overall shorter periods. The minister's experience in how long such things can take demonstrates the difficulty of trying to expedite immigration cases. Four months ago he undertook a review of 72 of the longest serving cases in the detention centres. He found 31 could be released but that 24 should be deported. As of yesterday, that all-important expeditious deportation had occurred in nine of the 24 cases. That means 15 illegal entrants slated for deportation are still here four months after a personal intervention by the minister when the detention system has a population of just 357, the lowest since March 1997. Because refugees come in waves, sometimes years apart, anyone who thinks Labor has relaxed our border protection or has solved the issue of long-term detention during a time of high refugee arrivals is deluded. The Rudd Government's principles on unauthorised arrivals and maintaining the integrity of the general immigration program are little different from the Howard government's principles, which were little different from the Keating government's, and for the same reason. Before the election, Kevin Rudd declared he'd turn back the boats and keep mandatory detention. This week's policy hasn't changed any of that. Mandatory detention: No Hard Feelings? We locked up and brutalised innocent people for years - then we stopped. That's not really good enough, writes Ezequiel Trumper. In the wake of the recent changes to our policy on refugee detention, I find myself embarrassed and ashamed. What has happened to this great and decent country? Am I the only one who thinks this way? I am not talking about what happened then but about what is happening now. I have felt like this since the day on which the Rudd Government announced the abolition of the mandatory detention regime for asylum-seekers two weeks ago. It was obviously not the decision but the reaction, or to put it plainly: the lack of any reaction. No reaction by the public or the mainstream media, little or muted reaction by opinion makers and commentators. Their silence was deafening. On the day after the dramatic announcement, The Daily Telegraph chose to run a rugby league story. The Sydney Morning Herald relegated it to page 4. The media coverage was limited to the ABC, SBS, and other relatively low-rating outlets. The public at large could not have appeared to care less. There were no calls for any inquiries into the damage suffered by those affected, no moral censure of the perpetrators of these horrendous human rights violations. Yet this is exactly what we were abolishing - or shall we call the incarceration of children just a "bad policy"? The Rudd Government decision was not the abolition of a levy, or of some obscure road tax. What Chris Evans did on the day was a public acknowledgement that the previous Australian government had committed serious human rights violations which, in most countries, would have warranted, as a minimum, a major inquiry, with serious consequences for the perpetrators. After all, is there any other developed country in the 21st Century which institutionalised and enshrined in black-letter law the incarceration of children? Isn't this what Howard and their ilk - the infamous Ruddock, Vanstone, and Andrews - have actually done? So what happened on the day this shameful chapter in our nation's history was closed by the new Federal Government? Well, very little. The public cared little. Mainstream media looked the other way. The Opposition made no comment on the demise of their unspeakable policy and its mandatory incarceration of innocent human beings indefinitely, including - I repeat - children. So there I was on that day, monitoring every mainstream news report on radio and TV - and for the two days following. I found a bit on the ABC and SBS, and very little else. I am not a conspiracy theorist, or a member of any fringe organisation. I am a centrist, free market supporter, conservative lawyer, climate change sceptic. I am as normal and decent as the next bloke. I like my football, and a good yarn. How could I then feel what I was feeling while so many of my compatriots could do and say absolutely nothing? This was a major moment in Australian history after all. So what was the reason? Are people ashamed that all this happened on their watch? Is the mainstream media embarrassed because in virtual complicity with the perpetrators they said and published so little about one of Australia's most serious errors? Or is it that we as a society just don't care about what we did. Because history will look at the facts and will attest to one thing: in an era of unprecedented economic prosperity the vast majority of Australians solemnly nodded or just tuned out as our very popular prime minister persuaded us that incarcerating children was just, and necessary for the sake of national security. This same majority treated the tiny minority who cared about the horrors taking place with derision, dismissing the plight of refugees as just "a Doctor's wife issue". I don't buy the argument that the Keating government started off with this policy and for that reason both political parties are equally responsible. That falsification of history ignores the extent to which the Howard administration exploited the race issue and perfected the cruelty of their inhumane detention policy, both within our borders and beyond, through the calculated perversity of the so-called Pacific Solution. The Rudd Government does not have a clear economic agenda, struggles on bread and butter issues, has dangerously placed too much political capital on climate change in times of economic uncertainty, does not have a strong cabinet line-up in key positions, and now it even appears it will have to fight much harder than most predicted to secure a second term. However, even if everything else turns to custard, it will already go down in history as the government that rectified one of the most horrific institutionalised human rights violations that has occurred in our short history. Prime Minister Kevin Rudd, Immigration Minister Chris Evans, and Attorney General Robert McClelland have guaranteed their entries in the history books for the best of reasons. For the victims, now growing up in our wonderfully prosperous country, the battle for justice has not even begun. For Australian society as a whole, however, the shame and the profound introspection that should go with it remain to be dealt with. When the Government changed our detention policy it didn't want too many people to notice, writes Andrew Bartlett. Responses to the Federal Government's recent reform of Australia's immigration detention policy have once again shown that debate over immigration issues in Australia is drenched in symbolism, political posturing and ideology, obscuring the human reality beneath. On the one hand, it is hard to imagine how it could be contentious for a government to state that we should not lock up people for long periods when they have not been charged with any offence, unless there are compelling reasons to do so. But as soon as you mention asylum seekers or refugees - let alone bring up loaded and misleading terms like "illegal immigrants" - at that point simple, humane common sense seems to go straight out the window. Ezequiel Trumper quite rightly expressed amazement and dismay that a decision by the Government to reassert such a basic aspect of the rule of law was done with so little fanfare. He was also angry that there was so little condemnation of the policies that were being discarded, and no "moral censure of the perpetrators of these horrendous human rights violations". Yet in announcing what should turn out to be a historic realignment in national immigration policy and law, the Labor Government has been as keen as anyone else to keep it low-key. Despite (or because of) the political significance of the issue, the announcement was made by Minister Chris Evans, not by the Prime Minister - even though the issue is ideally suited to Kevin Rudd's pre-election characterisation of John Howard's "Brutopia", and is also perfectly in tune with Mr Rudd's own praise of Pastor Dietrich Bonhoeffer and his notion of the Christian duty to support "the marginalised, the vulnerable and the oppressed". Despite some standard criticism by Chris Evans of the previous government's policy, he also made it very clear - in line with Labor's official policy - that "mandatory detention" was being retained. Indeed, Evans emphasised that number one of the Government's "seven key immigration values" is that "Mandatory detention is an essential component of strong border control". Labor has junked the old form of mandatory detention, but at the same time has been keen to retain the label, and also to keep linking it to other phrases such as "border control". In fact, the arrival of asylum seekers by boat has nothing to do with effective control of our borders, nor do any of the other tough terms deployed in this debate have any real value except to play on security fears in the community. The people who might threaten our security are those who try to sneak in undetected or use false pretences to avoid scrutiny of their intentions. By contrast, asylum seekers deliberately seek to be detected, and then undergo more rigorous assessment, including police and security checks, than any of the literally millions of other people who enter Australia every year. To some extent, one could say the Government's relatively quiet reform is just another example of politicians trying to use language that will appeal to both sides of an issue. But the underlying politics and community attitudes regarding immigration and refugee issues should not be underplayed. Labor's cautious approach on this, and the generally low-key political responses so far, are not just due to the psychological and political scars from 2001's Tampa election. We cannot ignore the fact that significant antagonism towards asylum seekers, refugees and migrants still exists in the wider community. While Ezequiel Trumper lamented how little coverage such a potentially momentous policy shift received in the newspapers, it was certainly sufficient to generate some heated comment on anti-migrant blogs around the world. There was also plenty of vitriol among the many reader comments left on mainstream media sites such as this one at The Courier-Mail. This can't just be dismissed as a venomous online fringe. Not long after Chris Evans's announcement regarding immigration detention, a survey found over 60 per cent of respondents believed Australia's past policy towards asylum seekers was either "about right" or "not tough enough". Only 24 per cent thought it was "too tough". Andrew Norton pointed to a number of other polls, including the 2007 Australian Election Survey, which also suggest that the level of public sympathy for refugees is not as strong as human rights campaigners might like to think. It is fair enough to say that governments shouldn't pander to such attitudes, and certainly the tactic from the Howard era of deliberately inflaming community antagonism towards refugees and migrants for political gain must continue to be condemned. But in shifting away from such past policies, it is asking a lot of any government to expect them to tackle such antagonistic attitudes head on - particularly if there is not a strong movement at community level also seeking to shift such attitudes. Major party politicians will only go so far in adopting measures which fly directly in the face of general public opinion. The more solid the public support for basic human rights to be equally available for migrants, the further governments will go in acting on this. Politicians do sometimes do the right thing just because it is the right thing to do. But contrary to popular opinion, politicians are human beings, and like anyone else, they are more likely to do the right thing if there is a reward rather than a punishment in doing so. The task of a human rights and migrants' rights movement is to try to make it politically rewarding to do the right thing. Articles that did appear in the mainstream media attacking Chris Evans' announcement recycled the same old baseless smears about security and terrorism risks from "softer" detention policies. The smear term "illegal immigrant" continues to be used regularly in the mainstream media, despite many efforts over a long period to educate editors and journalists about its inaccuracy. Ross Fitzgerald, a regular writer for The Australian, is one example of the continuing effort to use baseless innuendo about terrorism threats and the Howard-era propaganda line that a "softer" policy might "send a message to people smugglers that Australia is open for business again". Fitzgerald even came up with a term which would do The Hollowmen proud, talking of "potential illegals" and the possible dangers of allowing them to live in the community (ie they might be terrorists who will disappear if we don't keep them locked up). "Potential illegal" is the sort of term beloved of the spin doctor - basically meaningless and misleading, but perfect for playing on public fears and implying wrong-doing even when there clearly is none. It is hard to think of another policy which has been such a clear vote winner as Howard's detention "deterrent", despite it failing on virtually every measure normally used to assess the adequacy of a policy. It's not often mentioned, but it's definitely worth remembering that in simple policy terms, mandatory detention was a very expensive failure which did not achieve its stated goal of reducing the number of boat arrivals. Boat arrivals didn't drop until a decade after mandatory detention was brought in, partly as a consequence of the Government adopting the Hanson policy of using the military to push the boats back, along with changing trends in global refugee movements and evolving cooperation with UNHCR, Indonesia and other nations in our region. Mandatory detention cost billions of taxpayer dollars, caused major harm to many innocent children and adults, seriously undermined fundamental components of the rule of law underpinning our democracy, and caused serious degradation in standards of public administration. But the main goal of the mandatory detention policy was always a political one, not a policy one. It was not so much about reducing the number of asylum seekers, but rather about appearing "tough" on them once they'd arrived (although I have never figured out how it can possibly be tough to pick on some of world's most powerless people). The excesses of the Howard era, culminating in the shredding of the rule of law following the Tampa rescue, the pre-meditated brutality of detention policy and Temporary Protection Visas (also laudably scrapped by Minister Evans), galvanised the refugee rights movement in Australia, which played a huge role in stemming and slowly turning the tide of public opinion on this issue. But we should not kid ourselves that the task is anywhere near done, or that it only relates to refugees. The statements of people in government and other positions of leadership and influence are crucial in shaping public understanding and attitudes. Those of us who believe that refugees and migrants should have the same rights and respect as the rest of the community have a crucial role over the next few years, a role which will include encouraging government to adopt a more realistic rhetoric, to help build a clear majority in favour of a more just attitude. Only then can we be confident of a permanent shift in that direction in government policy and migration law. A shameful era is over in Australian politics. The Minister for Immigration, Chris Evans, has announced fundamental changes to a detention regime that was the cruellest in the Western world. It is cause for celebration, but it would be a terrible waste if Australians failed to learn the lessons of that time. It should never be forgotten that Australian politicians, with mass support, locked thousands of children and adults behind razor wire in desert camps, demonised them, stripped them of their names, turned the water cannon on them and drove many of them insane. This treatment broke their spirits and damaged their minds in ways Saddam Hussein and the Taliban never did. The vast majority were eventually found to be genuine refugees. It would do a disservice to the refugees if their ordeal taught us nothing. What is the lesson? It is, as I see it, for a country never to allow the ends to justify its means, especially when the means involve cruelty to children. Second, to respect the rule of law and the human rights that underpin a civilised society. Innocent people are destroyed when a government jettisons basic legal principles and betrays time-honoured values. Labor initiated and was complicit in a policy of staggering cruelty. Now it is atoning. Under the reforms, detention will be used only as a last resort and for the shortest practicable time. The presumption of automatic detention for people without valid visas will be over for most. Instead of a "lock 'em up, ask questions later" approach, the Immigration Department will have to ask questions first. A person who is not deemed to pose a risk will be able to stay in the community while their status is resolved. "Boat people" will still be detained for health, identity and security checks, but they will be given publicly funded advice and assistance. And once the checks are complete, will be freed pending a decision on their status. The "Pacific Solution" is gone with the closing of the offshore processing centres in Nauru and Manus Island. Labor has also abolished temporary protection visas, which consigned bona fide refugees to a death row existence even when they left the gulags, their status subject to regular revision. When Australia turned its back on the rule of law, abandoning habeas corpus and restricting the right to legal assistance, bad things happened to good people. Peter Qasim, a Kashmiri asylum seeker, was locked up in Port Hedland, Curtin, Woomera and Baxter detention centres for seven years. Others spent more than four years in detention for having the temerity to arrive on our shores seeking asylum. Asylum seekers landing on Christmas Island or Ashmore Reef found they were in a netherworld beyond the reach of law or human rights after the Howard government excised these places to thwart access to Australia's courts and lawyers. And the same denial of basic rights applied to those exported to Nauru and Manus Island. Australia flouted its human rights obligations and a regime of calculated cruelty took over. Detention centres became de facto mental asylums. If the government had wanted to undertake an experiment in how to destroy children's futures and saddle them with life-long problems, it could not have picked a better laboratory. More than 2000 children were locked up between 1999 and 2003 to punish their parents for fleeing, and to act as a warning to others. One was locked up for over five years. Psychiatrists told of the traumas children endured, and of parents' decline into depression and psychosis, but the government didn't care. Australia decided the ends justified the means and abuses of power resulted against its citizens and residents, too. Cornelia Rau and Vivian Alvarez Solon were the tip of an iceberg - at least 247 people were wrongly locked up, including a 15-year-old boy. An out-of-control bureaucracy got its marching orders from an unfeeling minister in Philip Ruddock and a lackadaisical one in Amanda Vanstone, both wedded to a policy of deterrence whatever the human cost. Yet cruelty had a limited deterrent effect. The boats kept coming through the worst, lip-sewing, hunger-strike years. Numbers fell away with a general decline in international refugee movements. The immigration lawyer David Manne concluded from his discussions with thousands of detainees, "There was never a serious suggestion the (detention) policies had anything to do with whether people came here - the driving motive was people fleeing to save their lives." The lesson is surely an ends-justifies-means stance can almost never be justified. But there is another lesson. Australians had the chance to reject the political spin and support the detainees. Many - mainly from the despised elites, such as lawyers and psychiatrists - saw the damage done behind the wire and gave blood, sweat and tears to alert the country. But most Australians greeted the accounts with indifference or hostility. We carry the legacy of that reaction in the broken adults and children living among us. If some Australians say "never again", that will be a lesson learnt. Labor's changes in detention policy will restore some humanity to national policy on illegal immigration. YESTERDAY a stain was removed from the soul of this nation. That stain was the inhumane, barbarous stance towards asylum seekers that had presumed them guilty merely because of their existence and then condemned them to indefinite detention. For too many years it had been official government policy towards political and economic refugees that they were treated as the enemy. It was shameful. For too many years, and one day would have been a disgrace, the children of these asylum seekers were treated in the same manner as the parent. This was more than shameful. It was a spineless creed cloaked in cheap, insensitive political posturing. Yesterday the Federal Government took decisive steps in redressing the wrongs of the past. Immigration Minister Chris Evans, in a speech at the Australian National University, outlined a new approach to asylum seekers; no longer will the onus be on asylum seekers to prove they should not be detained indefinitely. Now, the Department of Immigration will have to provide reasons as to why a person should be detained. And only for adults. Children no longer will be dumped in a detention centre. The Government has not scrapped mandatory detention, but it has made fundamental changes in the processing of asylum seekers that switches the premise of the system from adversarial to humanitarian. As Senator Evans quite rightly says, "Desperate people are not deterred by the threat of harsh detention - they are often fleeing much worse circumstances." To strip them of their humanity as a punishment for arriving unauthorised on Australia's shores was not, as Senator Evans, noted "an effective or civilised response". Three groups will be subject to mandatory detention: unauthorised arrivals with health, identity or security risks to the community, unlawful non-citizens who pose risks to the community and those who have repeatedly refused to comply with visa conditions. Detention moves from first option to last resort, and for the "shortest practicable time". Reviews of a person's case will take place every three months. People who do not fall into the three categories will live in the community until their immigration status is decided. "The department will have to justify a decision to detain - not presume detention," Senator Evans says. This is, in effect, cutting the razor-wire logic of the syllogism on which the odious system existed. There is some historical irony in the fact that it is a Labor government doing so, when it was the Keating government in 1992 that moved to tighten illegal entry to Australia during the flood of boat people from Cambodia and China. However, from its election in 1996, the Howard government refined the processing to suit its ideology and political purposes. Its treatment of refugees resulted in places such as Baxter, Nauru and Villawood becoming examples of a callous disregard for human rights, and in the eyes of the world it damaged Australia's reputation in humanitarian and refugee issues. Senator Evans noted yesterday that the United Nations Human Rights Committee in the past decade had made 14 adverse findings against Australia in relation to detention. In 2007, the Human Rights and Equal Opportunity Commission found after visiting the detention centres that grave concerns were held for the mental health of the detainees. The Age has been at the forefront in reporting the conditions under which detainees have been held and the profound adverse impact it has had on them. For critics of mandatory detention and the many who have publicly spoken out against it, especially within the Coalition, such as Victorian Liberals Judith Troeth and Petro Georgiou, yesterday must provide some comfort. That an Australian Government would deny people their future, left in limbo, out of sight and out of mind, was one of this country's darkest chapters. Australia is built on the efforts of immigrants; and legitimate refugees can, and do, make this country a better place. In 2005, the then immigration minister Amanda Vanstone was asked if the government would make any compromises towards a private member's bill put forward by Senator Georgiou in relation to the detention system. Senator Vanstone replied: "We fought two elections on strong border controls." She could have just as easily said, "We fought two elections by playing on people's fears." Labor says a secure border and a humanitarian approach are not mutually exclusive in dealing with asylum seekers. We agree. Yesterday, Australia began the process of restoring some of its lost humanity.